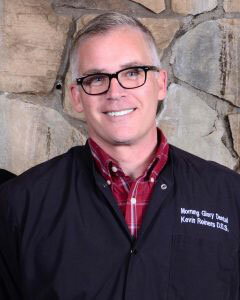 Dr. Kevin Reiners is a 2011 University of Nebraska Medical Center College of Dentistry graduate. Prior to receiving his dental degree, Dr. Reiners earned a BS in mathematics, a BS in computer science, and an MBA. Education is important to Dr. Reiners, and he continues his dental education as often as possible in order to provide his patients with the high-quality care they deserve. Dr. Reiners previously served on active duty in the Navy and is a current member of the Army National Guard. As a dentist, his goal is always to explain treatment options fully, and to provide the service that is best for the patient. He has his patients’ best interests at heart. When he’s not improving your oral health, Dr. Reiners enjoys a variety of hobbies and activities, including cars, board games, card games, woodworking, and yard work. He loves spending time with his family, which includes his wife Irene and his children Uriah, Sydney, Jenna, and Alexa.